Happy Monday! Instead of feeling the Monday blues like I usually do today, I’m feeling happy and excited. After a fun weekend in Austin celebrating my friend Kat’s bachelorette, I’m flying up to Carmel, California this morning for five days of relaxation. Follow me on Instagram to see my adventures while I explore the quaint little beach town! If you have any things you think I must do while I’m there, let me know! All recommendations are welcome!! I may not have made the best shoe choices packing for New York Fashion Week, but I definitely remembered to bring my Stuart Weitzman 5050 boots. They’re an essential when you’re planning to walk a lot, so these boots are perfect for all kinds of traveling. Particularly since it was so beyond cold, they were very useful this trip. I had originally wanted to wear this pair of pumps by Nicholas Kirkwood with this outfit, but decided last minute not to test them on the NYC slush. Boy am I glad I switched, because I didn’t have a chance to stop back by the apartment the rest of the day! This was certainly my most comfortable outfit at NYFW. 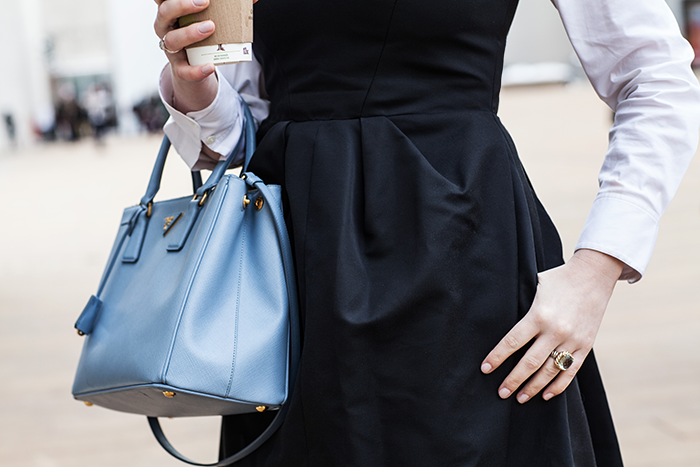 A good amount of layering in classic black and white, with just a pop of color from my blue Prada. PS – congrats to Nikki McCain, winner of the Panasonic Beauty Nanoe Prize Pack! Stay tuned for another amazing giveaway soon! love this black and white look, I’m so jealous you are flying to Calu today I so need a vacation. Have Fun! Have a wonderful time! A vacation sounds wonderful right now. I will be living vicariously through you! Love how you layer this dress, enjoy your vacation! Layering was key during NYFW! It was SO cold! 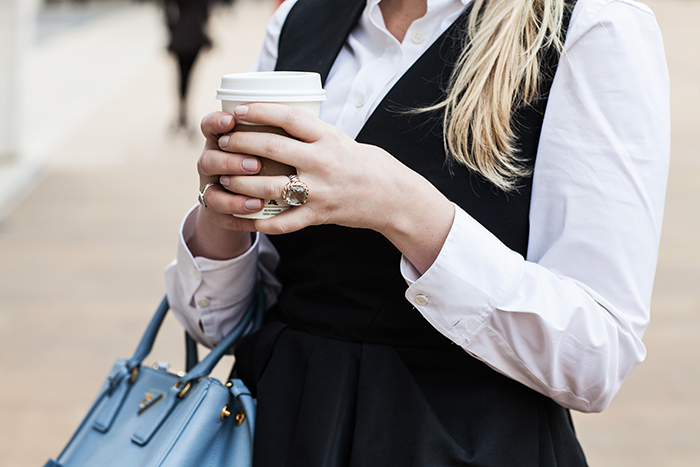 Love the classic black and white with a pop of baby blue! Love this classic look! So jealous of your CA getaway, have fun! ooh, I adore that LBD. such a great shape! and I love it with the classic white button up, powder blue Prada and those boots! I love this layered look! That black dress is amazing! Those boots are to die for!!! So jealous! :) I love the black and white with the blue bag! Adore this look on you! Still dying over this coat, and I had the same debate with shoes in NY but every time I went with flat boots i was always glad i did! lol :) Happy Monday! 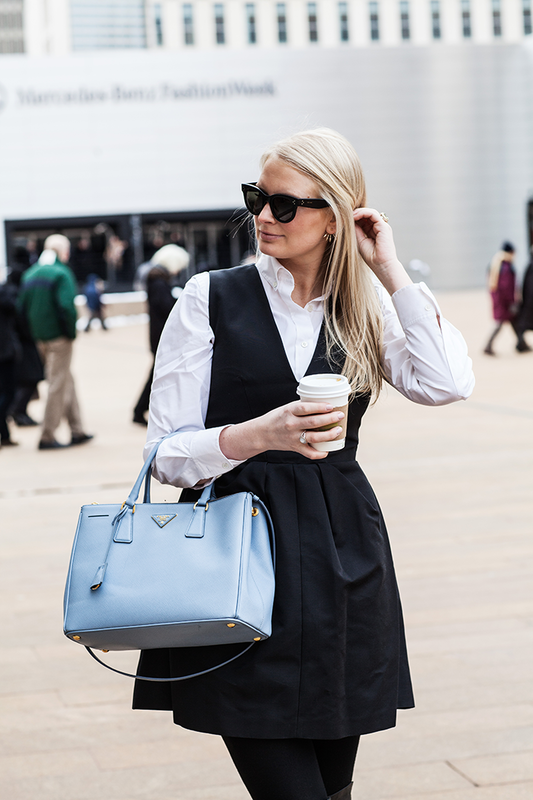 You look amazing- love the way you layered and of course I’m in love with that bag…. The boots are a smart chouce- the people who wore heels were a little nutty in my opinion- not weather appropriate and kind of dangerous haha! Be sure to check out the new giveaway on my blog today! Have the best time Merritt!! Great look and stunning boots! 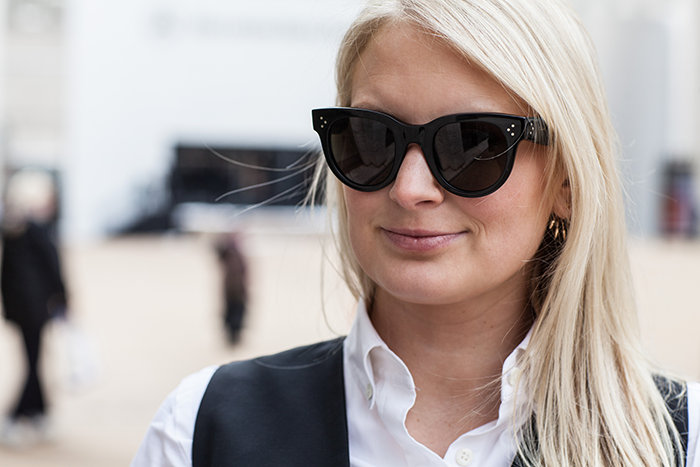 Such a classic look and love the layering – b&w suits you girl! I like this a lot. I really adore the dress, especially the pockets. Have so much fun, Im ready for my next vacation. Love this outfit! It looks perfect for a cool day and I’m so happy that you are going to have five days to relax! Enjoy every minute! That bag is to die for and asalways…love this look.